Damodar Mauzo, an eminent Konkani writer in Goa who returned his Sahitya Akademi Award in 2015, has been protesting the growing atmosphere of intolerance in the country in the form of assassinations of rationalists, writers, and journalists, as well as lynchings in the name of cow protection. A joint statement of Sahitya Akademi Award winning writers from Goa, termed the right-wing activism as a menace to scientific temperament and literary and cultural renaissance. His retaliation against cultural terrorism created by the right-wing fundamentalist forces has cost him his safety. He has been provided protection by the Goa police after a Special Investigation Team reported his name in the hit-list of Sanatan Sanstha (a right-wing Hindu extremist group. This, however, has not deterred him. Damodar Mauzo responds to the recent comment by Vishwanath Prasad Tiwary that the return of awards in 2015 was a "political conspiracy". 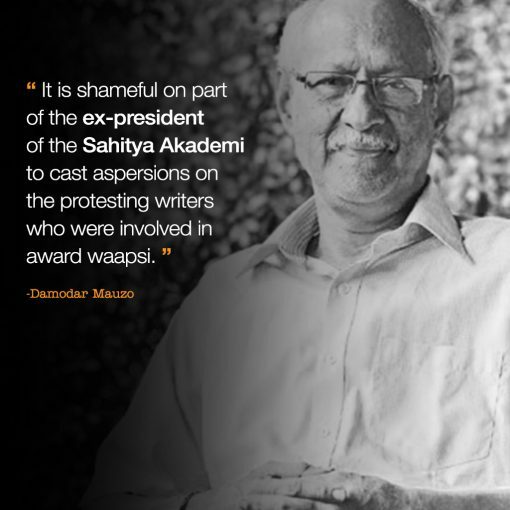 "It is shameful on part of the ex-president of Sahitya Akademi to cast aspersions on the protesting writers involved in Award Wapsi. It was a crucial time for the writers' fraternity to express solidarity with the cause, in view of the assassination of an award winning writer who was a member of the general council of the Akademi. Indian writers, like those the world over, have always stood by their right to Freedom of Expression. They have consistently sided with the sacrificial victims, the marginalised elements and the exploited ones. I deplore the accusations made by the former president of Sahtya Akademi who himself has fallen prey to the pressure tactics of the people in power. Damodar Mauzo: "The Idea of India is Under Assault"